Want to save 25-35% on your postage expenses? How can we sell stamps cheaper than the post office? We deal in stamps for collectors. 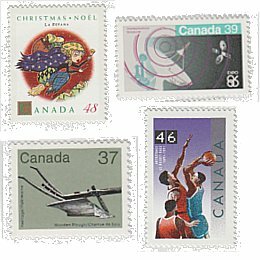 Many collectors bought a lot of new stamps from the Post Office and tucked them away - far more stamps than they could use for their own collections. The population of stamp collectors is declining and there are more stamps around than there are collectors! Since there is no collector demand for these excess unused stamps, their only value is for use as postage! The only thing to do is to use them for what they were intended - to pay to deliver letters! Absolutely! The post office originally sold them for use as postage. The fact that they have been stored by a collector for several years makes no difference at all. 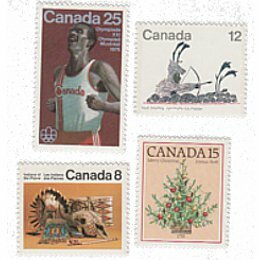 In fact, all Canadian stamps issued as far back as 1859 are still valid for postage! The stamps are all unused, and as fresh as the day they came out of the post office, including their full original gum. These are older stamps, so they are not the current rates available from the post office, but you can use them in any combination to make up current rates. Are these stamps really unused, or have they been soaked off uncancelled mail? We have been asked this question a couple of times, so let's dispense with it here! There are people out there marketing "unused, uncancelled" postage, or "unused, no gum" postage. We can assure you, absolutely and categorically, that is not what we are offering here! There are plenty of legitimate, surplus stamps in collectors' hands. These stamps are just like what you would buy at the post office - just a few years older! These stamps were issued when postage rates were lower, so they are not the current rates. However, you can use them in any combinations you want to make up any current rate. The more stamps you are willing to put on your envelopes or packages, the more you save! The more stamps you are willing to put on your envelopes, the more you save! We package stamps according to denomination. Each lot is priced based on $100 face value of the denominations shown in the Groups below. The lowest denominations save you the most. If you are ordering at least $100 face value, you may split your order between the Groups shown here. For example $50 Face Value Group I ($33.75) plus $50 Face Value Group II ($35.00) equals $68.75 total for $100 Face Value. All stamps shown are samples only. The exact stamps included will vary. Subject to availability. Due to constantly higher postal rates, this group is most in demand. We frequently have a waiting list for these stamps. We cannot supply stamps with values over $1 as we have standing orders for these values. Using old stamps dresses up your letters! It gets them noticed! Perfect for donation requests, club notices etc.! Our minimum order is $100 face value. An order may be split among the Groups shown above. Orders do not have to be in $100 increments. You may order any amount, in any combinations, as long as the total is over $100 face value. For orders under $300 face value, please add $5.00 per order for insured delivery anywhere in Canada (we use Expedited Parcel with signature to addresses in Ontario and Quebec, registered mail or Expedited Parcel with signature elsewhere). We do not charge additional handling fees. This postage fee is a flat rate. It does not increase with your order size. Free shipping on orders over $300 face value! (any combination). Sorry, we do not accept personal or business cheques. Can I claim my GST/HST? Your order will include our proper invoice, with our GST registration number. If you are GST/HST registered, you may claim any GST/HST paid to us as a GST/HST Input Credit just like you do with Post Office invoices. Use our on-line order form. 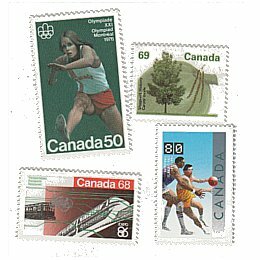 Yes, we are constantly buying collectors' surplus mint Canadian stamps. Please visit our buying page for information.